The Pacific coastline is by far the most dynamic environment I could imagine. Is there a more challenging place to cast a fly? I’m not sure one exists. Think about it for a moment; you have the constant rise and drop of the tide, the addition of a littoral current, swell, erratic breakers, even floating debris can be found in the mix — the marriage of these elements creates a magnificently wild scene. The dynamics here demand your attention. Your fly fishing success is critically based on homework, observation, adaptation, and a solid gameplan. I’m constantly amazed at how little time people will invest in their “surfperchin’ skills.” In my opinion, unless youmake this arena a priority (like your trout and striper games for example), your chances for success are nothing more than a long shot at a craps table. Capice? Take the time and make the effort to explore the beach as often as possible. The place is truly wild and offers a different picture day-to-day and hour-by-hour. There’s no doubt in my mind that you can increase your catch rate with a stronger commitment to the surf game. Let’s take a look at two key features in the yearly cycle of the surfperch. Both of these cycles will bring larger fish into the shallow breakers.The first significant period begins in late Autumn and continues through the early winter months. Depending on where you’re located along the Pacific, the cycle spans from November well into February. It’s a significant time because this is the breeding phase for surfperch. Often you’ll find your catch is dominated by males loaded with milt.The gestation period for perch is approximately five months. The next important phase takes place from mid-spring to mid-summer. Essentially from May through July you’ll find the females back in the breakers completing the spawning cycle. Keep in mind that surfperch are viviparous and these “live bearers” probably seek the calmer pools or deeper troughs to release their young. Another key to the surfperch’s lifecycle is their adaptation to the intensity of the surf zone. If the habitat appears to be too abusive you can expect the fish to favor far deeper haunts. Numerous species of perch will range to depths well beyond 100 feet. Though all the various surfperch frequent shallow environs of 30 feet or less, it’s perfectly natural to find a wide variety of species hovering at depths beyond 200 feet! Why is it important for us to know the depth range? I believe it illustrates one of the reasons why there’s going to be days when you can’t even buy a fish in the surf zone. The list clearly demonstrates the wide reaching movement of any given species on any given day. It just makes sense for a perch to drop in the water column where the environmental conditions stabilize during periods of very heavy surf. The surf zone is used first and foremost as a transitory environment for either feeding or breeding. Secondly, and only if the conditions allow, will the birthing of a future generation of surfperch take place. The surf is by no means a habitat that houses a perch 24 hours a day, or 365 days a year. 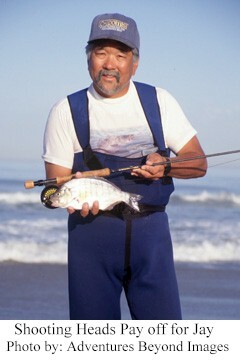 The ever-changing conditions will either promote activities in the shallows or drive the perch away from the beach. Nature has a wonderful way of providing species with the tools to survive. Take the surfperch’s mouth structure for example. 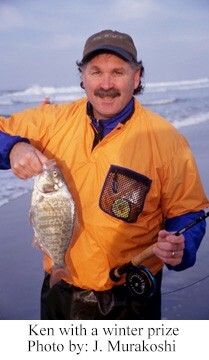 It’s perfectly adapted for finding and capturing prey in the tumultuous extremes of the surf zone. The perch’s mouth is built to work much like a vacuum’s hose. Given the fact that debris and food are both turned-n-churned in a very tenuous situation, the perch has little time to distinguish items by site. Their mouth extends into a cone to enhance the suction behavior needed to effectively trap any food item (particularly those living in the benthic zone). Their primary feeding technique is referred to as “oral winnowing.” They simply inhale a group of items — roll them around in the mouth — and discard anything that isn’t considered acceptable food. Their diet consists of the following items; crustaceans, clams, marine worms, and to a lesser degree tiny fish. 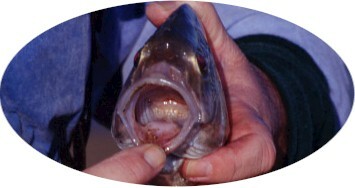 Take a close look at the throat of a perch and you’ll find another clue as to the dominant food source. Located deep in the throat is a fully developed set of teeth. These dentures are quite blunt but substantial as crushing tools. The perch are ultimately built to favor sandcrabs and shrimp in their diet. “Bottom feeding” might best describe how surfperch first orient themselves in the hunt for sustenance. Perch frequenting the surf have employed yet another feeding tactic we should acknowledge as well. It’s commonly known as “random feeding behavior.” To be succinct, if the fish bumps into something by chance, it will basically try to sample it as a food item. 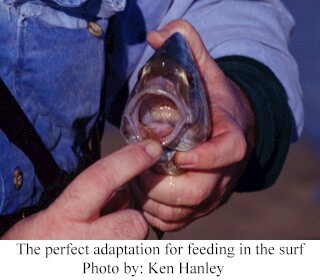 Opportunistic feeding is critical to the survival of these gamefish. To ply the Pacific surf zone we recommend outfits rated at seven-weight or heavier. Let me underscore the reason why — you need to initially match your tackle to the rigors of the habitat not the species. Heavy hydraulics, onshore winds, an unstable casting platform, and more will contribute to extreme pressure placed on your outfit. Because the perch game requires constant casting, you may wish to limit your selection to a ten-weight ceiling. Working with lighter blanks can be a real blessing under most surf zone conditions. However, if you plan on pursuing larger gamefish (such as flatties, stripers, or even roosterfish down in Baja), you’ll want the option of increased leveraging that the nine and ten-weights will provide you. Line selection is pretty direct for surfperchin’. Use any design that gets your fly down quickly. Over the decades I’ve worked successfully with 13′ sink tips, standard shooting heads, and modified shooting lines. I would recommend that you avoid full sinking lines as an option. Typically they won’t respond as fast as you need to in changing conditions. Understand that much of your success will be based on how you adapt to the time you’re given between waves. Consider this; you need to cast, let the line sink to the feeding zone, get it under control, and conduct your retrieve all before the next wave pounds you and your tackle. It is without question a “time dilemma.” Those of you located from central California onward into the Pacific Northwest will certainly find this a greater challenge throughout the year. If you opt for a shooting head system, it appears that most west coast anglers find applications for lines rated from type #4 to #6. The same sink rates seem to apply to sink tip designs as well. Working with modified shooting lines, such as the Teeny T-Series, I find the T-200 handles most of my needs. During the winter season I prefer to use the T-300 model during heavy surf cycles. With such a turbulent environment I look for ways to increase my control from rod-to-fly, and back again. Limiting the length of my terminal system has been a very positive move. Generally I work with a straight leader (rated at 10 pounds). Starting with a low tide phase I use approximately six feet of leader material. As the tide builds, I chop the system back, usually ending the day with a leader about 3 feet in length. Another option for my terminal system includes working with a brace of flies. These past few years Jay Murakoshi and I have preferred a two-fly rig based on a combination of sandcrab and shrimp triggers. Our dropper is most often a small unweighted shrimp pattern. The lead fly can either resemble a crab or its colorful roe sac. The combination of flies presents us with a quicker opportunity to locate feeding perch. Before you head out to your favorite beach, please allow me to make one more observation and tip. Perch are constantly on the move. 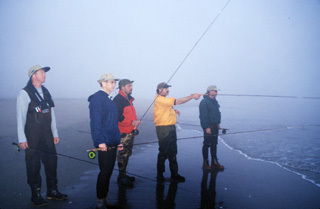 Don’t stay in one place too long or you’ll lose the ability to “work the tide.” Usually all it takes is a dozen casts (or less) to find out if there’s any perch interested in your fly. Don’t marry the property — instead, force yourself to cover the beach and you’ll likely jump a school that can provide fast action. Cheers! This entry was posted in Authors, California, Fly Fishing Destinations, Ken Hanley, Tackle and Techniques Magazine. Bookmark the permalink.